This is a partial preview. Full document is 62 slides. View large preview. Each Umbrella Strategy is each further divided into 4 more Strategic Approaches. The composite of 16 Strategic Approaches and 4 Umbrella Strategies forms the "chessboard." The Strategy Chessboard is useful in navigating through the plethora of strategic thinking philosophies and frameworks, to determine the optimal choice for your organization's particular situation. You can compare this framework to the BCG Strategy Palette (we also have a presentation on this available on Flevy), which is also a holistic framework that distills the strategic thinking among innumerable strategy models introduced over the years. This presentation explains the theory behind the Strategy Chessboard, as well as detailed explanations of each of the Umbrella Strategies and Strategic Approaches. 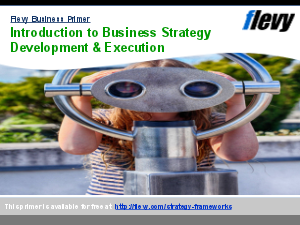 It also details a 3-phase, 9-step approach to Strategy Development by utilizing the Strategy Chessboard. Additional topics covered include Strategic Playing Field, Industry Predictability, Evolutionary vs. Revolutionary Environments, Strategy Obstacles, Case Examples, among others. This deck also includes a set of slide templates for you to use in your own business presentations.